The St. Cloud State Reformatory was established in 1887 as a correctional institution for first offenders between the ages of 16 and 30. The reformatory opened in 1889 with the transfer of 77 inmates from the state prison at Stillwater. It was located on 240 acres in St. Cloud to take advantage of the labor opportunities provided by the granite quarries of that area. After the turn of the century, numerous vocational departments were created, including construction, clothing manufacturing, shoe manufacturing, printing, greenhouse, and farming. The reformatory’s farm operated from 1923 to 1956. Farm work was also done by inmates at the reformatory’s prison camps at East Grand Forks and Moose Lake from 1943 to 1958. Logging was done at a third prison camp at Walker from 1943 to 1958. In July of 1945 the Annex for Defective Delinquents was opened at the reformatory. It was to be used for the custody of mentally handicapped adults for whom the state had no adequate housing. Initially, individuals were transferred there from the (then) State School for the Feeble Minded at Faribault and the State School at Owatonna. Begun as a two-year temporary measure in 1945, this program was renewed every two years by the legislature through 1961. The annex was closed in 1963. The upper age limit of those admitted to the reformatory has changed numerous times. Most recently (1973), the limit was lowered from 24 to 21. Since 1979 the institution’s name has been Minnesota Correctional Facility--St. Cloud. Records for the St. Cloud State Reformatory can be viewed in person at the library or ordered online from our Correctional Institution (Prison) Records Request. Photocopy of a Cardex index to the reformatory’s general inmate case files and to its Youth Conservation Commission inmate case files; supplemented by other indexes to smaller portions of the reformatory’s inmate records. File numbers 1-30,281, constituting the institution’s general inmate case files for inmates discharged prior to July 1, 1978. Each case file may contain some or all of the following types of records: court documents, record of pre-sentence investigation, "face card" containing photographs and identifying information at the time of admittance, caseworker investigation record, medical data, reports and memoranda on inmate activity, education data, inmate case summaries, documentation of visits outside of the prison, and related data. The volumes for 1896-1935 contain two-page records of descriptive and background data on each inmate. They are fairly complete for inmate numbers larger than about 900 (up to 12120). The earliest volume, labeled "Convict Register" (1887-1897), contains substantially the same information for inmate numbers 1-818. An intake record, apparently compiled at the time of admission to the reformatory, containing summary descriptive and background information about individual prisoners, many of whom were juveniles. Information includes inmate’s name and number, a brief description of his crime, dates of conviction and admission, physical characteristics, date of birth, and ethnic, family, educational, and religious background. Includes space for subsequent remarks by reformatory administrators, and for dates of parole, transfer, escape, and/or discharge. Spine titles say "Statistical Record." There is also a foldered chronological register (list) of inmates admitted (1918-1927). Black and white photographs of reformatory inmates, although not all inmate numbers are represented. Each photograph may include brief identifying information such as name, aliases, birth date, race, height, weight, build, eyes, hair, complexion, and date of admission. Record of parolees from the St. Cloud State Reformatory, generally giving the following information: name, registration (institution case file?) number, county received from and date, crime and sentence, date of parole, date term expires, kind of work engaged in and wages, name of employer, address, number of months imprisonment, number of months on parole, and a record of periodic reports (date and parole officer’s memo). MNHS call number: See the finding aid in the library (St. Cloud State Reformatory). Case files for youths remanded to the Willow River Camp correctional facility by the Youth Conservation Commission, following physical and psychological testing at the commission’s reception canter located at the St. Cloud Reformatory. File numbers 6-4119, constituting case files for persons who passed through the Youth Conservation Commission’s reception and diagnostic center during the period when it was located at the reformatory. These files are only for youths who were not incarcerated; thus the file number sequence is not complete. Those incarcerated into the reformatory were assigned a number within the institution’s base file, and their YCC file was incorporated into the base file. Others were sent to the Willow River Camp correctional facility, and their files were constituted as a separate unit. Entries are by half-month, thereunder by department. Minnesota Department of Public Institutions Personnel Service Records- St. Cloud, 1933-1938. St. 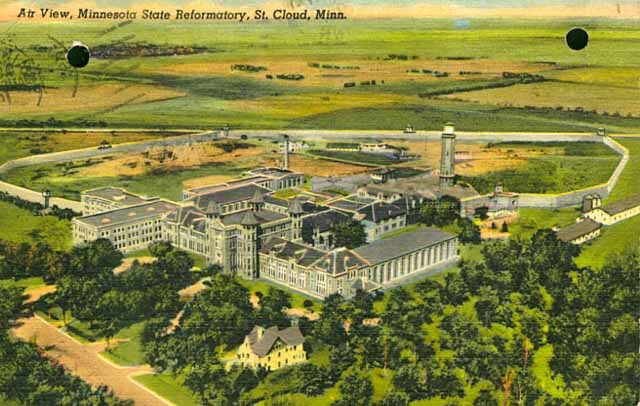 Cloud, Minn. : Minnesota State Reformatory for Men.